BRISBANE is enduring a creepy autumn as plagues of biting insects swarm the city after weeks of rainfall ramped up the blighters’ breeding. The unseasonably wet and warm weather extending into autumn has led to increases in termites, mosquitoes, midges, wasps, fleas, cockroaches and redbacks. Repeated council sprays have done little to dent mosquito numbers, while pest controllers are overwhelmed with calls. Dunrite Termite and Pest Control owner Steve Annells said the insect onslaught had been ongoing since late January. “They’ve been running amok and they are rampant,” he said. Buzzkill pest control owner John Herbert said the past two weeks had been particularly busy, which he blamed on the lingering warm, moist weather ­conditions. Brisbane City Council has conducted multiple sprays to try to keep the mosquitoes at bay, including an aerial ­assault on March 26, covering 1300ha from Bald Hills to Tingalpa, and ground sprays over the Easter long weekend at Bald Hills, Boondall and Wynnum. Those areas are considered mosquito strongholds due to their proximity to saltmarshes, which are key breeding grounds for the bloodsuckers. 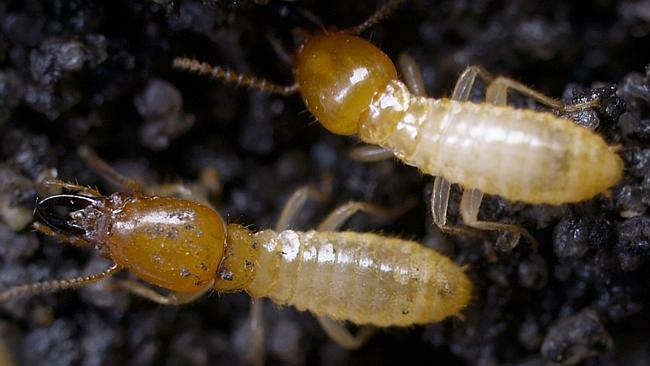 Unseasonably wet and warm weather extending into autumn has led to increases in termites. The council’s field services chairman David McLachlan said there had already been almost 300 calls about mosquitoes this financial year, adding that the weather had provided ideal breeding conditions. “Many calls come from suburbs located closer to saltmarsh mosquito breeding areas,” he said. Opposition councillor Kim Flesser said the council needed to be more proactive in combating biting beasts. “People are prisoners in their own homes. They can’t go outside early in the morning or in the evening without getting attacked by mosquitoes potentially carrying Ross River virus,” he said. More than 1900 cases of Ross River virus were recorded in Brisbane by Queensland Health in the first three months of the year. Midges have also been out in force but Mr McLachlan said there were no ­chemicals registered or available in Australia to control midge larvae. The city council spends about $3.5 million on mosquito management each year, but it increases the budget if necessary to deal with unexpected outbreaks.